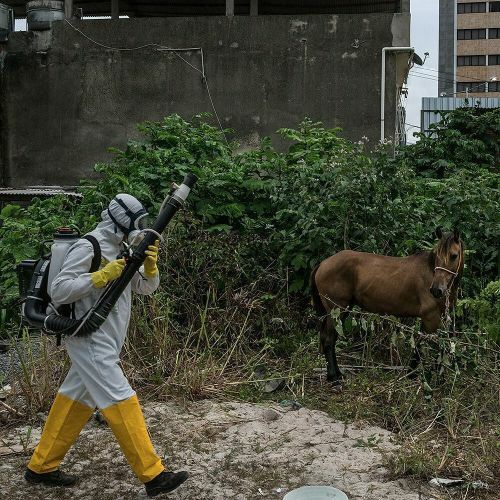 "A municipal health agent in Recife sprayed insecticide last month to combat Aedes aegypti mosquitoes, which transmit the #Zikavirus. Zika, once an obscure virus discovered in Uganda in the 1940s, was long thought to pose relatively little harm compared with some other diseases transmitted by mosquitoes, like malaria and dengue. But as Zika spreads, international health officials are anxiously monitoring Brazil's efforts to combat the virus. This #nytweekender, we're sharing photos by @limauricio, a freelance photographer who has been on #nytassignment documenting a trail of Zika-borne anguish in Brazil." By nytimes on Instagram.